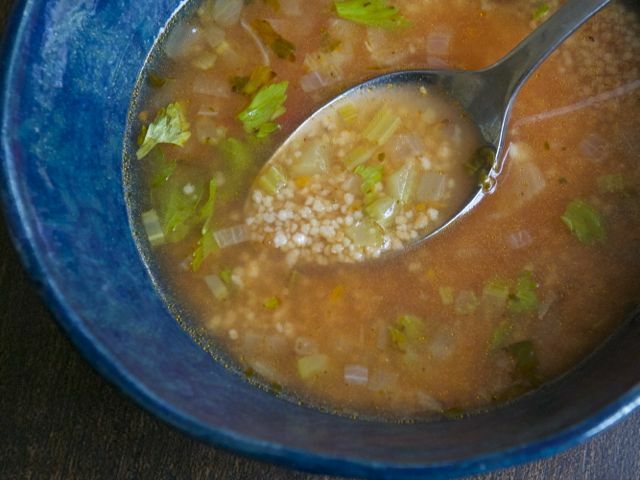 The texture of couscous in broth is extremely comforting, so if you have couscous and tomato paste in your pantry, a bowl of this soup should be in your very near future. If you have no fennel or celery, substitute carrots, zucchini, green beans, or even chopped greens in the same quantity. If you have already-cooked couscous, use 3 cups of it instead of raw, stirring it in after the soup comes to a boil and reducing the cooking time to 1 minute. The texture will be somewhat thinner, however, and the wheat flavor won't be quite as pronounced. Put the olive oil in a large saucepan with a tight-fitting lid over medium-high heat. When hot, add the onion and celery and cook, stirring occasionally, until soft, about 2 minutes. Add the za'atar and sprinkle with salt and pepper. Stir constantly to keep the spices from burning and cook until just fragrant, about a minute. Add the the couscous and continue stirring and cooking until the couscous begins to toast and darken, 2 to 3 minutes. Stir in the tomato paste until it is evenly distributed and begins to color, another minute or two; then add the stock and stir to dissolve the tomato paste. Bring the soup to a boil, then turn the heat down to low, cover, and cook without disturbing until the couscous is plump and tender, 5 to 10 minutes. Taste, adjust the seasoning, and serve. Za'atar is a tangy, nutty seasoning used throughout the Arab world. To make your own: Crumble with your fingers 2 Tbsp. dried thyme into a small jar or bowl. Stir in 2 Tbsp. ground sumac, 1/4 cup toasted sesame seeds, and, to taste, salt and freshly ground pepper. Store tightly sealed in the refrigerator for up to a month. Culinate editor's note: In the Culinate kitchen we often use Homemade Veggie Bouillon in recipes that call for vegetable stock or broth. If you use the bouillon, don't add salt while cooking the soup; salt to taste once the soup has finished cooking.